Yesterday evening at approximately 4:00 p.m. deputies with the Calcasieu Parish Sheriff’s Office Warrants Division attempted to serve Justin J. Fontenot, 36, 6859 Tom Hebert Road, Lake Charles, an active warrant for felony theft and monetary instrument abuse at his mobile home. When deputies arrived at the home and knocked on the door a couple of people ran out the house and stated Fontenot was inside the home armed with a shotgun. Deputies immediately retreated from the residence. Minutes later deputies with the CPSO ACT-Team arrived, set up a perimeter and evacuated several mobile homes within close proximity of the scene for safety. A negotiator attempted to make contact with Fontenot numerous times but was unsuccessful. 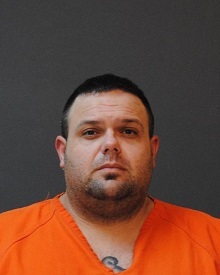 Due to having no contact with Fontenot deputies deployed several tactics, such as robots equipped with cameras, deploying tear gas, phone calls to Fontenot on his cell phone, and the PA system, in an attempt to allow him to safely exit the house, but all were unsuccessful. Shortly after midnight deputies made entry into the home and located Fontenot in a bedroom with the shotgun nearby. Fontenot was taken into custody, arrested and booked into the Calcasieu Correctional Center and charged with terrorizing; and resisting an officer with force or violence. Judge Ron Ware set his bond at $35,000.